Life on Gas Giant Planets? Understanding the quasar power source is one of the most challenging tasks in astronomy. In the most luminous quasars, 1000 times the light from an entire galaxy is contained in a volume not much bigger than the solar system. Normal stellar processes are not efficient enough to produce this fantastic energy density. Can we show this? Yes! Suppose that we use the velocity of the hot gas near the quasar core to get an estimate of the mass in the central parsec. Then assume that normal stellar fusion is causing the energy release (without worrying for a moment about how a sufficient amount of stars could get into such a tiny volume). The Sun releases 0.7% of its mass in the form of radiant energy. Therefore, if M is the total mass of main-sequence stars within the central parsec, E = 0.007 Mc2 is the maximum amount of energy that could come from stars within that small region. The observed amount of energy is 15 to 40 times larger. In other words, the energy source within a quasar is so efficient that it releases 10% to 30% of the mass-energy locked in matter. Stellar fusion cannot do this. The basic ingredient for the model of the quasar power source is a supermassive black hole. This compact object is the gravitational "engine" that powers many of the observed properties of quasars. We have seen that the evidence for black holes in nearby galaxies is quite strong. Quasar black holes would have to be in the range of mass from 106 to 1010 solar masses. There is no observation yet that probes scales close to the Schwarzschild radius. You should recognize that the black hole model for quasars is speculative and does not have the secure status of, for example, the model of stellar evolution. According to the standard model, the supermassive black hole at the center of a quasar forms and grows by accreting (gathering) gas and stars from the central parts of a galaxy. Since most galaxies rotate, the black hole is also likely to rotate. The law of conservation of angular momentum indicates that it will be spinning rapidly. No radiation can escape from the event horizon of a black hole. However, material that is falling in will be accelerated and will emit huge amounts of radiation. The region around a supermassive black hole is an enormous particle accelerator, converting the potential energy of material that falls in into radiation and kinetic energy of relativistic particles that flow out. This process is very efficient. 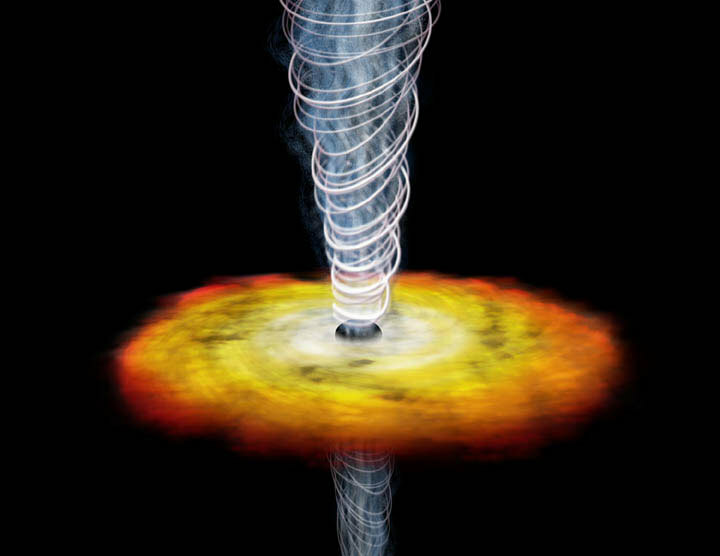 In principle, a rotating black hole can convert 20% to 30% of the mass that falls in into pure energy, sufficient to explain the enormous luminosity of quasars. Most of this energy emerges in the form of non-thermal radiation, which can span the entire electromagnetic spectrum. Some quasars have been detected at every wavelength from radio waves the size of a person to ultra-high energy gamma rays the size of an atomic nucleus! A second major ingredient of the quasar model is an accretion disk, the reservoir of hot gas and dust that feeds the black hole. Rotation of the material that falls to the black hole forms a disk rather than a spherical cloud. The proximity of an intense radiation source means that the disk will be hot. Thermal spectra with temperatures of 10,000 to 20,000 K have been observed in a number of quasars, consistent with the expected radiation from an accretion disk. Plasma at this high a temperature puts out most of its energy at ultraviolet and soft X-ray wavelengths and surveys have indeed shown that most quasars are strong X-ray emitters. Such a hot disk would "puff up" into a torus, or doughnut, rather than flatten like a pancake. This geometry would obscure our view of the black hole in the equatorial plane, making it visible only along the poles of the spin axis. Outside the accretion disk are small dense clouds of gas orbiting the supermassive black hole. Clouds at distances of under a parsec are partially ionized by strong ultraviolet radiation from the central engine, and they move at speeds of tens of thousands of kilometers per second in the strong gravity created by the black hole. 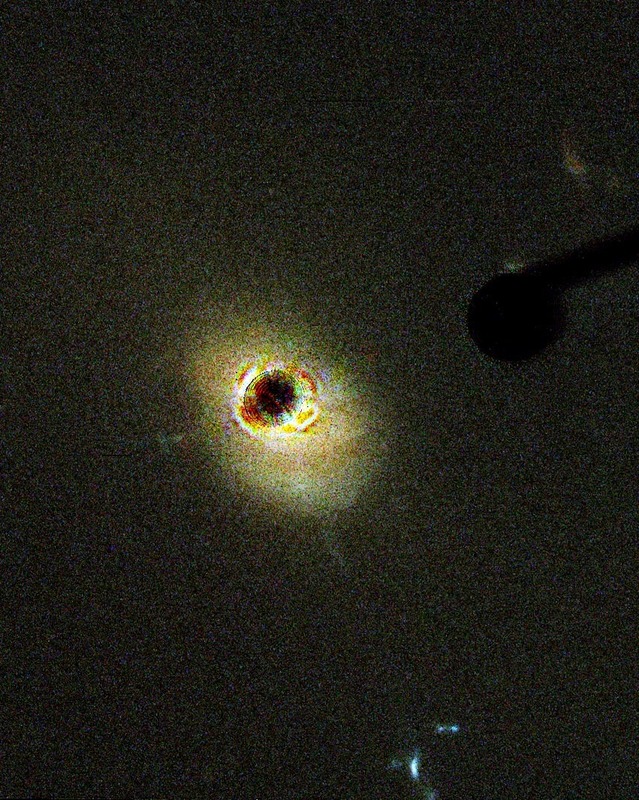 This region gives rise to the broad lines seen in quasar spectra. Astronomers have developed a clever technique called reverberation mapping to measure the mass of the quasar black hole. The power source varies and with some time delay the clouds that emit the broad emission lines vary too. That time delay gives a size for the broad line region (R) and the width of the emission lines gives the velocity of the gas (ΔV), induced by the gravity of the supermassive black hole. According to Kepler's laws, the black hole mass M = R/G (ΔV)2, where G is the gravitational constant. 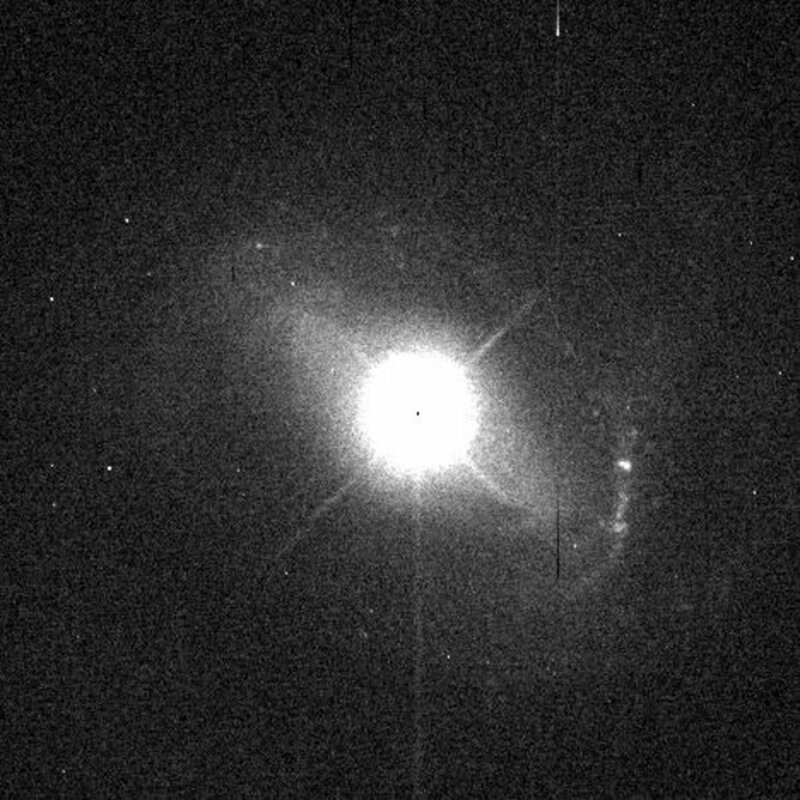 All quasars show broad emission lines, but many lower-luminosity active galaxies in addition show narrower emission lines, with widths of hundreds of kilometers per second. The gas that gives rise to the narrow lines is much farther from the central engine; the clouds are distributed over kiloparsec scales. 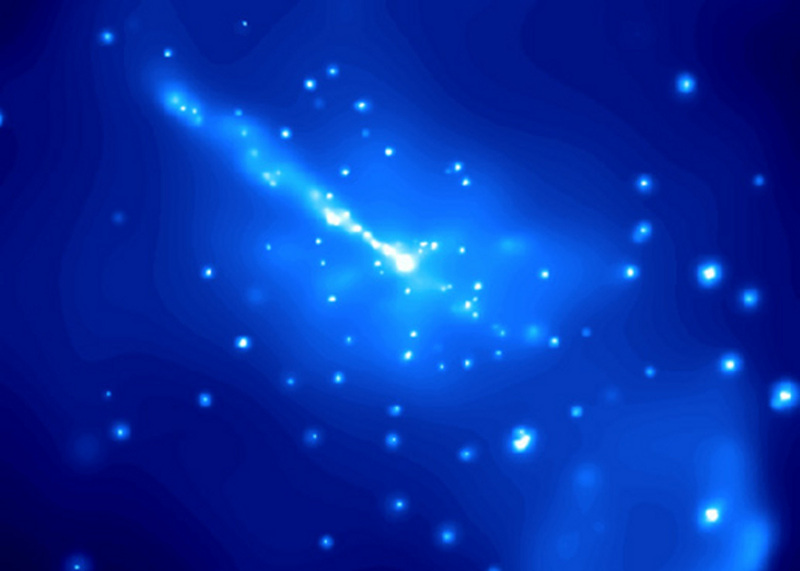 Some quasars have the most spectacular signature of nuclear activity: radio jets. 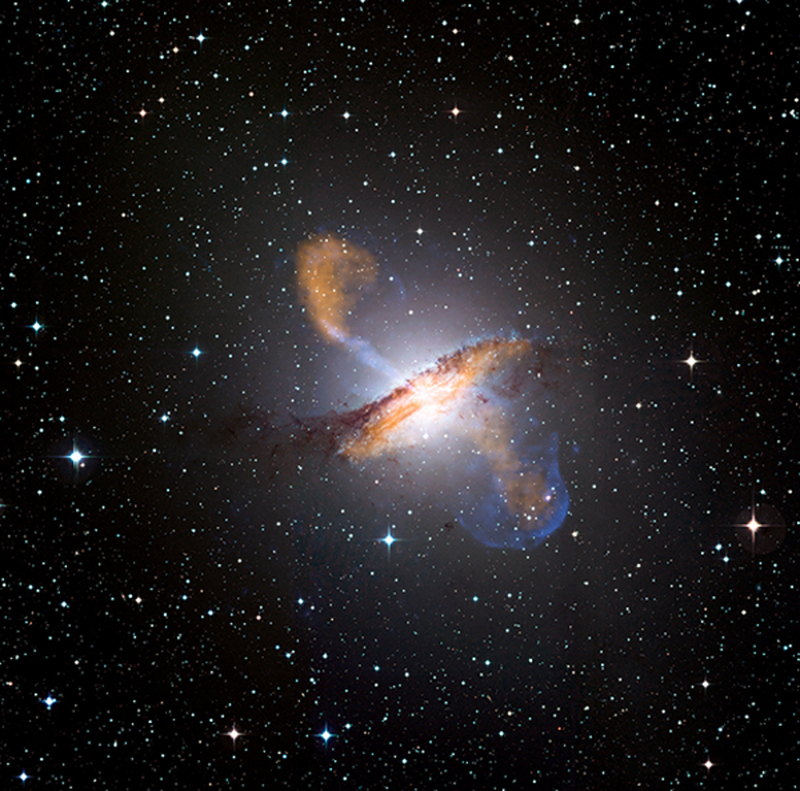 Most quasars are weak radio sources; jets are observed only in quasars that are strong radio sources. The region around a supermassive black hole can act as a powerful particle accelerator. The accretion disk blocks most of the outflow, but material can be accelerated in the two directions perpendicular to the disk, along the spin axis. Quasar jets are relativistic. The material that flows out can be moving at 90% to 95% of the speed of light, and the individual high energy particles can be moving at over 99.9% of the speed of light. The region in which the jet forms is extraordinarily complex, with high-energy particles, radiation, shock waves, and magnetic fields. Supercomputers are used to simulate the structure and evolution of a jet. Radio observations reveal a rich variety of astrophysical jets. Some of them emerge from the nuclear regions, leave the host galaxy, and extend for millions of light years into intergalactic space. Can astronomers relate the life story of quasars to our observations of nearby galaxies? Ten billion years ago, black holes grew quickly in the centers of massive galaxies, fueled by the frequent interactions between galaxies in the early, dense universe. The highest redshift quasars place severe constraints on theories of how black holes form and grow. The highest redshift quasar has a redshift of 7.1, which means that a black hole managed to form and grow to several billion solar masses in only 750 million years after the big bang. Since their peak about 5 to 8 billion years ago, quasars have been gradually fading. Supermassive black holes cannot disappear! However, they can lose their ability to shine brightly if they have no fuel. As the universe expands, there are fewer interactions among galaxies, and as stellar populations evolve, the amount of mass loss available to fuel nuclear activity diminishes. By now, most quasars have been starved into a sullen silence, with very occasional episodes of activity. If we add up all the quasar luminosity at the peak epoch of quasar activity and assume the supermassive black hole model, we can work out the mass of quasar remnants that must persist to the present day. The prediction is that most galaxies will have 106 solar mass black holes, 10% will have 107 solar mass black holes, 1% will have 108 solar mass black holes, and so on. Amazingly enough, searches for central black holes in nearby galaxies have found black holes at roughly the predicted rate. The glory of quasars occurred billions of years ago, but we still see their dark shadows, lurking in the hearts of nearby galaxies.